Previous message (by thread): How to contribute fix for checking x509 extended key attrs to nginx? Was there a change of behaviour as per how PUT requests are redirected via X-Accel-Redirect between 1.6.2 and 1.10.2 versions? 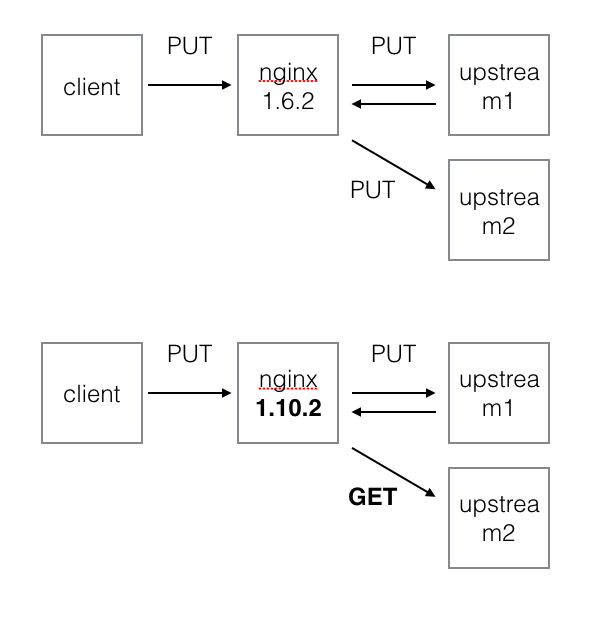 In nginx 1.6.2 the PUT request from the client is internally redirected as PUT via X-Accel-Redirect. In 1.10.2 it is redirected as GET. So the method name is changes when the redirect happens. The redirect is between two upstream servers (and not the client) via an internal location. Is there a way to achieve 1.6.2 behaviour?